What is urban renewal? It typically involves taking underused or abandoned land and transforming it into something new that is both aesthetically pleasing and functional. It can also transform abandoned infrastructure, like rail lines, which saw a decline in use beginning in the 1960s that has led to many abandoned tracks throughout the United States. Today, the High Line in New York City and the Katy Trail in Missouri are some of the results of urban renewal on former rail lines. The Rails-to-Trails Conservancy (RTC) is a major proponent for projects like these, and it has awarded more than $1.7 million to trail projects since 2008. Involved in many stages of the process, RTC is a valuable resource for any group looking to revitalize a former rail-trail. And railroad corridors do make perfect trails, since they are gently sloping and accessible for those walking, rolling, and more. Community: what does the community want, and, specifically, how do the neighbors feel about trail lighting? Has an environmental assessment been completed to determine the effect of lighting on local wildlife? 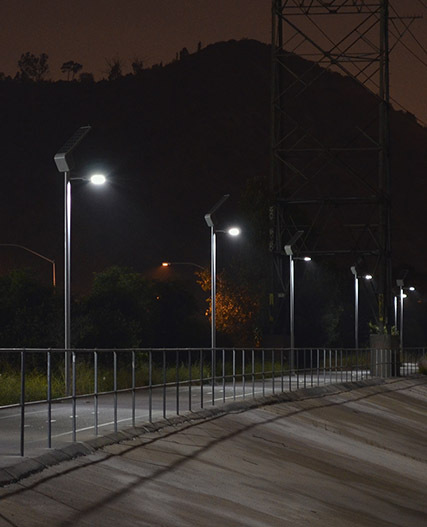 Lighting types: Will you choose electrical, battery-powered, or solar-powered lighting? What makes sense with your budget and maintenance desires? Placement and design: Do you have a lighting professional to help with AASHTO recommendations, aesthetics, light shielding, and other specifications? Installation and maintenance: Who will be installing the lights? Who will be responsible for maintenance over time? Funding: Where will the funding come from for your project and, specifically, for your trail lighting?